I could be wrong—believe it or not, there is precedent for that—but I get the feeling that Supernatural is trying to reboot and extend its own mythology a bit, midway through a season that started out with the creative team using new characters and unfamiliar character shadings for the leads, but not enough of them, to try to freshen up old tropes that had served the show well in years past but have just run their course. This season has had its definite high points, but they kept leading back to Crowley and Kevin and his damn book, and it began to feel that, if the apocalypse is going to keep coming back, again and again, and worse, keep looking so much the same with every re-appearance, fine, just bring it on and be done with it; it’s got to be more fun than boring the world to death. Although it remains to be seen if the subplot involving Amanda Tapping’s Naomi is about anything but the same old Machiavellian-angels power games that the show has been playing with since it got into Christian mythology, last week’s introduction of the Men of Letters and the whole bookish side of secret supernatural work represented by the brothers’ paternal grandfather’s side of the family is the first really new kink the show has thrown itself for a while. It’s promising, and it helps freshen things up. For one thing, what with its fetishizing of being on the road, one masculine fantasy the show has never been able to do much with is the daydream of having your own secret clubhouse. Sure, there was Bobby’s shack, but that place looked like the cabin in The Evil Dead after dark and probably had something greenish growing in the sink. Tonight, the brothers find the long-lost hangout of the Men of Letters, and basically move in, and I can’t say as I blame them: The spacious digs offer Sam a comfortable place to stretch out with his research materials, and Dean enjoys the excellent water pressure in the shower and what Sam unkindly refers to as his “dead man’s robe.” Even Sam can’t figure out why the water and electricity work just fine, and he would be well advised not to give it any thought. That’s just how daydreams work. For once, the brothers are living in style. Of course, anyone who’s ever upgraded to sweet new digs knows that’s when the uninvited guests start tumbling out of the woodwork. Tonight’s special guests include nice Jewish boy Aaron Bass (Adam Rose) and his golem, played by John DeSantis, whose previous credits include Lurch on The New Addams Family and Solomon Grundy on Smallville—and a murderous ghost on the “Ghostfacers” episode of Supernatural, back in the third season, which feels like a couple of lifetimes ago. Aaron has inherited the golem from his grandfather, a Nazi-chasing Rabbi played by Hal Linden until he exits the show through spontaneous—actually, Nazi-abetted—human combustion. Now that gramps is toast, Aaron and his golem comprise all that’s left of the Judah Initiative, which seems to be a Jewish counterpart to the Men of Letters that has been pitted against the Thule Society, a bunch of “Nazi necromancers” led by an immortal, or at least eternally youthful, survivor of World War II. You see how a person could get the impression that the show is busy minting enough new mythology to crowd out some of the old mythology that’s been turning to deadwood. Advance word on this episode had it that it was largely “comedic.” There are, as Joel Robinson used to say, funny elements, such as the detail that the former wastrel Aaron didn’t know how to fully “take charge” of his golem because, even though his grandfather had once gifted him with what amounted to an operator’s manual, he hadn’t taken the whole business seriously and used the thin sheets of the book for rolling papers. But even that doesn’t really seem ha-ha funny in context—Rose plays it as if he were deeply remorseful for his youthful stupidity—and if I hadn’t been tipped to expect a laugh riot, I wouldn’t even be wondering if maybe this was a failed comic episode in which the timing was just way off. I can see where using Nazis and Jewish folklore as material for horror comedy could be a real challenge. When the head Nazi (Bernhard Forcher) barges in on the Winchesters, and they start throwing around the N-word and he asks if they couldn’t maybe just leave the “Nazi” thing on the shelf for a moment, I sort of knew how he felt. But if this episode doesn’t work as comedy, except maybe for a scene in which Dean can’t figure out whether he’s being shadowed or hit on—“We didn’t have a moment. This is a federal investigation.” “Is that supposed to make you less interesting?”—it works, for me, anyway, as an odd little story with a slightly mournful tone that wasn’t inappropriate for the subject matter. I think I like it better than I remember liking The X-Files’ golem episode, where the heaviness of the themes of avenging racism and anti-Semitic violence got heavy in a way that weighed down the fun. 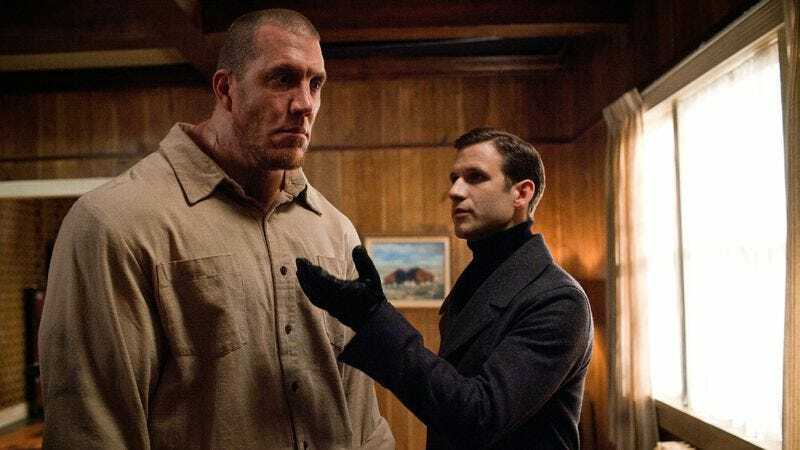 And though it’s anyone’s guess whether we’ll see either of them again, Aaron and the golem go on the list of new characters this season who make for a welcome break from some of the older ones. (It’s interesting that the show has made Garth increasingly important as a character—Bobby’s official, self-appointed replacement, who’s managed to improve on the master’s work in a few respects—while scarcely showing him on-camera much, and maybe not just because DJ Qualls is busy personifying male terror of losing control of your body on Legit.) Next week: The return of Kevin and his damn, damn book. How that turns out will likely prove to be the test of something.